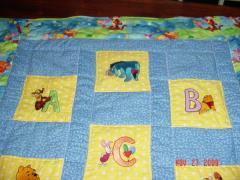 This is pretty embroidered quilt which will perfectly look on children room’s floor. We used some interesting samples. You may find all of them in our Old Toys machine embroidery designs collection. There are some rabbits, bears and other toys on this mat. They seem to be shown at frame of huge window. Each of embroidered picture is executed on separate piece of fabric. Then they were collected on one big space. There is the set of six patches with embroidered cartoon characters made by Marita Tjulander‎. These funny pictures are ready to decorate the clothes or any textile accessories: Twinkletoes machine embroidery design is the pretty blue rabbit, Blubber machine embroidery design — funny lazy seal, Shy teddy bear machine embroidery design — pretty bear girl, Fashion teddy bear machine embroidery design — little bear in huge hat, Duckling with bouquet embroidery design — cute bird with many flowers. There are two embroidered patches with the images of cute cartoon heroes made by Marita Tjulander. At this time she chose two embroidery samples for her work. First of them is Fluffy pair machine embroidery design — the picture of two funny cats loving each other. The other one is Cute bear girl machine embroidery design — the image of cute little bear with the gift in red package for the beloved person.